“Yes!” was the instant response when asked if I would like to spend a morning at Sebright Primary School in Hackney shadowing a team of City Year London volunteers. Having heard so much about the fantastic work the “Red Jackets” do it would be great to see them in action. 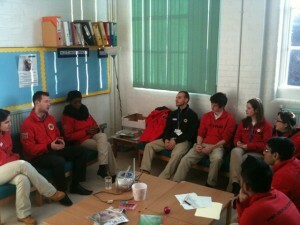 City Year London class themselves as London’s leading youth and education charity. They believe that young people can change the world and so they recruit around 100 18-25 year olds per annum for a year of community action. They serve in schools in deprived communities and these young people act as mentors, tutors and role models. They also recruit many volunteers for one-off opportunities where they help renovate schools and community centres in London. 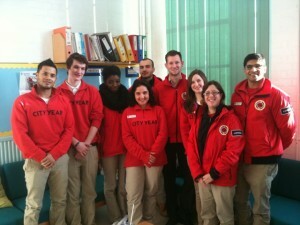 City Year London are one of the Volunteer Centre @ LSE Career’s closest charity partners. In the 2011-12 academic year four LSE alumni took part in their full time programme volunteering 3750 hours to supporting young people in schools. They also recruited 21 one-off volunteers from LSE who contributed over 756 volunteering hours. Huge achievements by any standard. So what was my morning like at Sebright School? I was lucky enough to see the current crop of volunteers in action in the class room and the playground and also talk to them about how they were finding the experience. It was clear after chatting to them for just a few minutes their passion for supporting disadvantaged children is huge. They were articulate in what their goals were and whilst being idealists, they were also realistic about what could be achieved. It was also obvious how much they, as volunteers, are getting from the opportunity. The way they described how they have had to adjust their teaching and communication styles when working with different children showed me that they are improving their soft skills all the time, something that will be incredibly useful when applying for jobs after their year of volunteering. After hearing so much about the famous “Red Jackets” it was a privilege to see them in action and I’m confident they will all go on to be successful in whichever career path they choose, whilst making a huge contribution to society in the meantime. They are all fantastic representatives of City Year, Sebright Primary School and their communities. I would recommend City Year to any young person as a unique way to test and improve their leadership skills either through their full programme or at one of their one-off opportunities. I would also like to give a big thank you to City Year staff for inviting me, all of the volunteers that gave up their time to talk to me about their work and the staff of Sebright Primary school for being so welcoming. Keep up the good work! NextThe Paris Marathon – what was I thinking?